Mueller State Park is a Colorado state park encompassing 5,112 acres (20.69 km2) of land outside Divide, Colorado, northwest of Colorado Springs, Colorado. The park offers many outdoor activities. 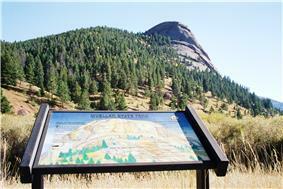 There are 55 miles (89 km) of trails, biking, camping year-round, hunting, hiking, horseback riding. It is open in the winter and snowshoeing, sledding and snowtubing is allowed as well. Mueller is a diverse home to a variety of animals including elk, black bear, eagles, hawks and bighorn sheep.